This may look like a weird combination in an unconventional dish but I can assure you that as soon as you taste it, everything will make sense. 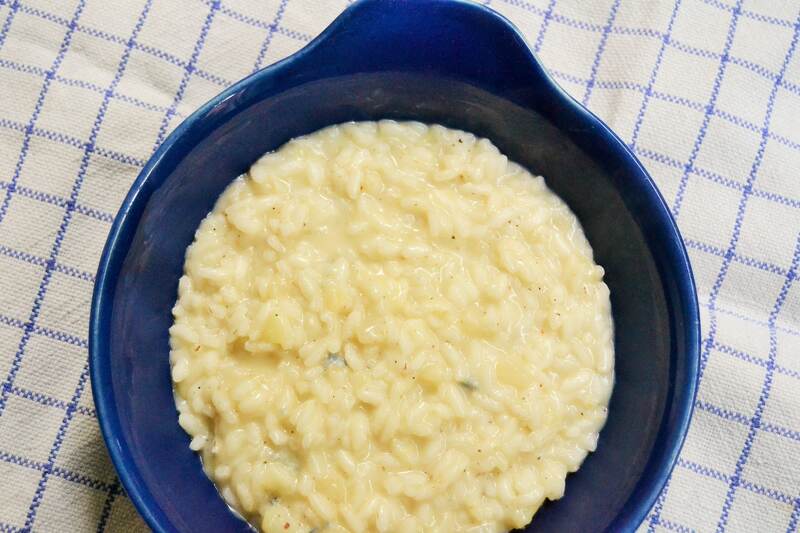 The strong flavor of gorgonzola cheese will balance the sweetness of the pear making a creamy and delicious risotto. In Tuscan we have a say “Al contadin non far sapere quant’è bono il cacio con le pere” which translates in “Don’t tell the farmer how good it is cheese with pears”. I don’t really know why we must not tell the farmer but it is an ancient “poor dish” to eat fresh Pecorino cheese with pears. When I was little I used to eat it very often cutting the cheese and the pears in small cubes and mixing them together. 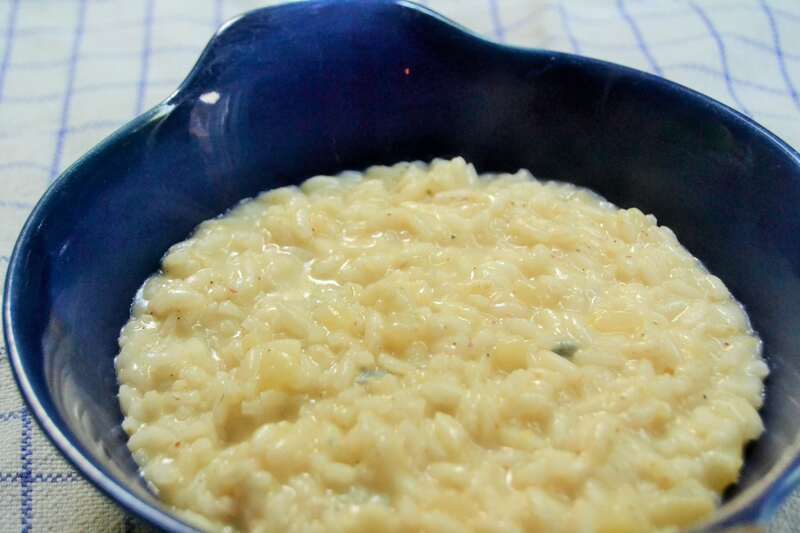 Of course since it is a dessert, I could not use fresh Pecorino cheese in the risotto otherwise it would be too sweet, therefore I tried with stronger cheeses that could compensate with the peat’s sweetness. I tried with Taleggio first and then with Gorgonzola and I think that Gorgonzola wins. But you can try also with different strong cheeses. Peel and cut the pear in small cubes then quickly fry in a little bit of olive oil just until they start to brown, add a pinch of salt then set aside. In the same pan drizzle a little bit more of olive oil and toast the rice at medium heat for 1 minute then add the finely chopped onion and cook another 1 minute. Pour the white wine and let in evaporate completely, then add a couple of ladles of broth and bring the heat to low; add more broth as soon as the rice absorb it. 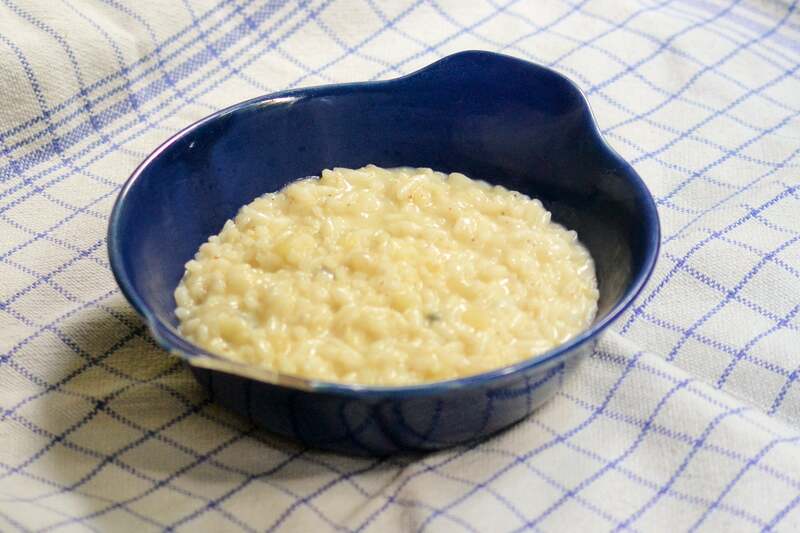 When the risotto is nearly ready (at this point there should be almost no liquid), add the Gorgonzola cheese and let it melt; then add the pears with the butter and the Parmesan cheese and turn off the heat. Mix well so the risotto will become smooth and creamy then add some freshly ground black pepper on top. Serve immediately.